If you've been around these parts before you may have noticed that I'm a huge fan of blue and green. 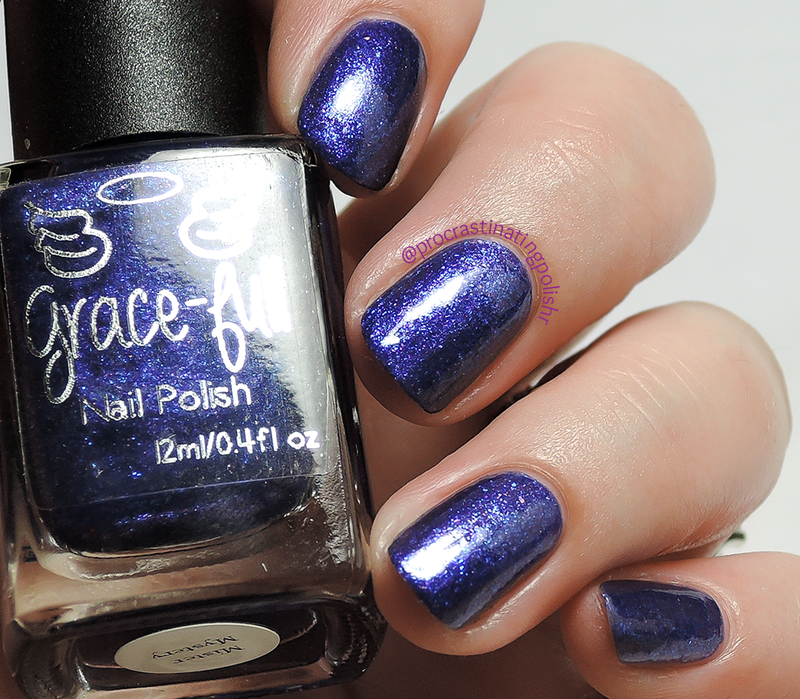 So imagine my reaction when I get sent an amazing package of polish from the lovely Theresa of Grace-full Nail Polish and it is full of the most beautiful spectrum of blues, greens and purples! I opened each one slowly ooh-ing and aah-ing at each one, then spent the next few days in swatching heaven. I have four to show you today - glittery goodness inspired by that spectacularly colourful bird, the peacock! 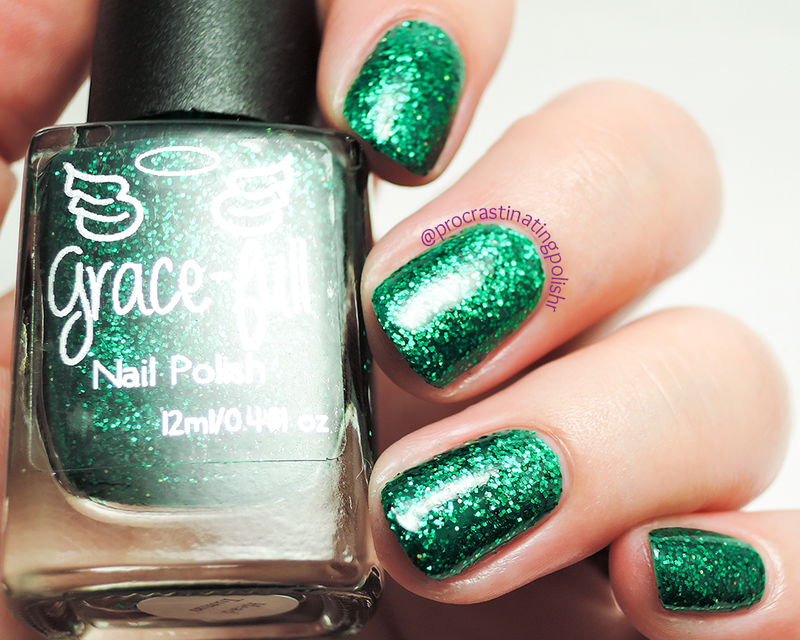 Emerald jelly and glitter that had me weak at the knees. 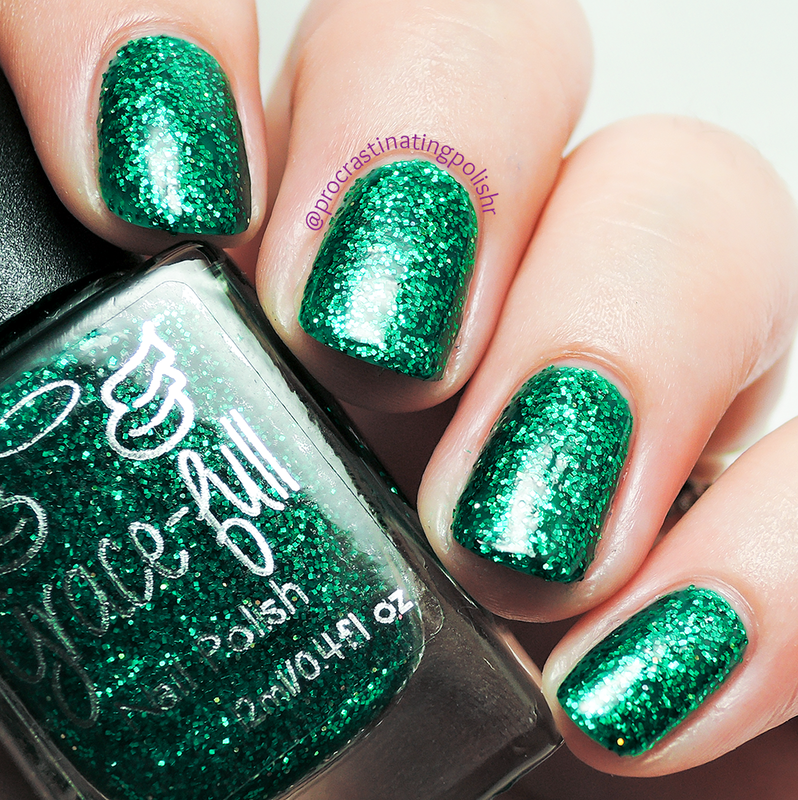 Emerald greens are my absolute favourite, and this is so vibrant and metallic that it sent me a little gaga. It's quite a simple polish, but it's really all about the colour for me. There are some lime green and gold holographic glitters scattered through the polish that give out random sparks of light - you can see some little flashes on my pointer above and my pinky below. The formula was beautiful, needing only two coats for perfect opacity. Take care to let the first coat dry for long enough before going in for a second as smaller glitters love to drag. 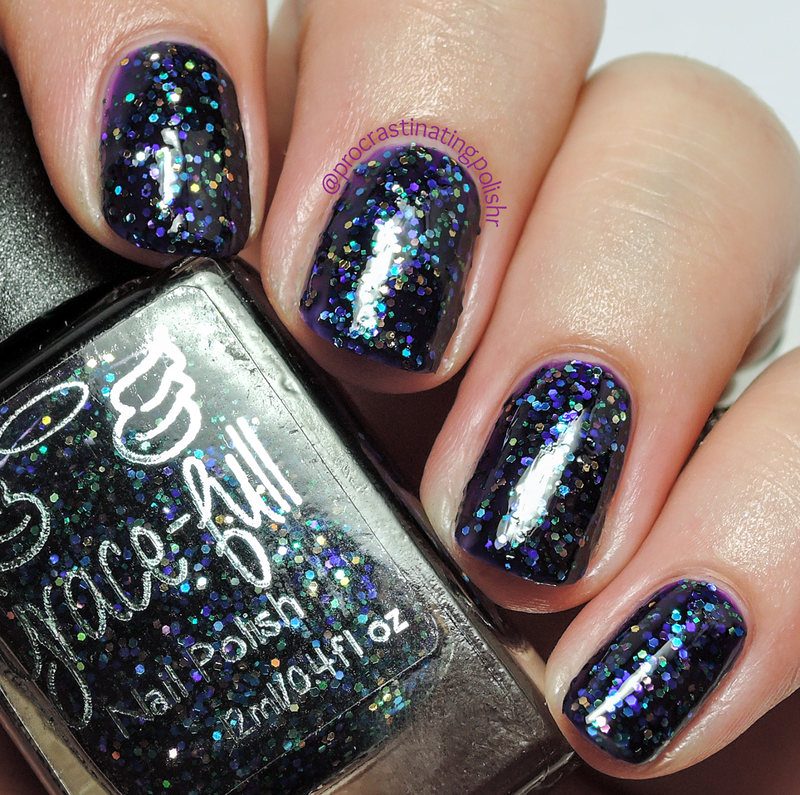 Undoubtedly mysterious, Mister Mystery is a deep blurple shimmer with blue and pink flakies. I just couldn't photograph this one - the flakies were very camera shy and my camera read it way bluer than it appears on the nail. You should check out the stunning macros on the listing for this one as I have not done this any justice. 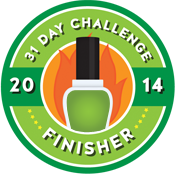 On your own nails this is full of life from the flakies and shimmer, and it has a lovely easy to use formula. I did three thin coats in my swatch. A true peacock rainbow - at first glance it appears to be filled with a few holographic colours, but it's actually a whole range of individual colours scattered in a deep royal purple jelly. According to the Grace-full site, the glitters are bright gold, teal, evergreen, aqua, turquoise, purple, sapphire, lime green, emerald and navy. Whew! 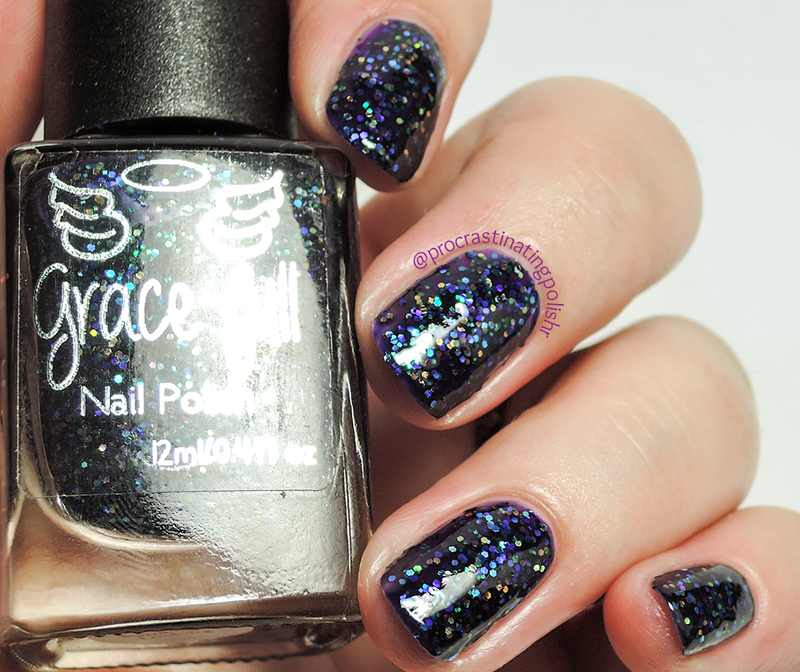 I love the contrast of the super dark jelly with the brighter glitters. I did two dabbed coats and found it was perfect, though I would recommend a nice thick top coat to smooth this one out - I didn't quite achieve a nice glassy finish with my regular top coat. Wanna know the exact notes I made on this polish? ^ That is all I wrote in my notebook about Show Stoppin'. It's a polish made of blue heaven. 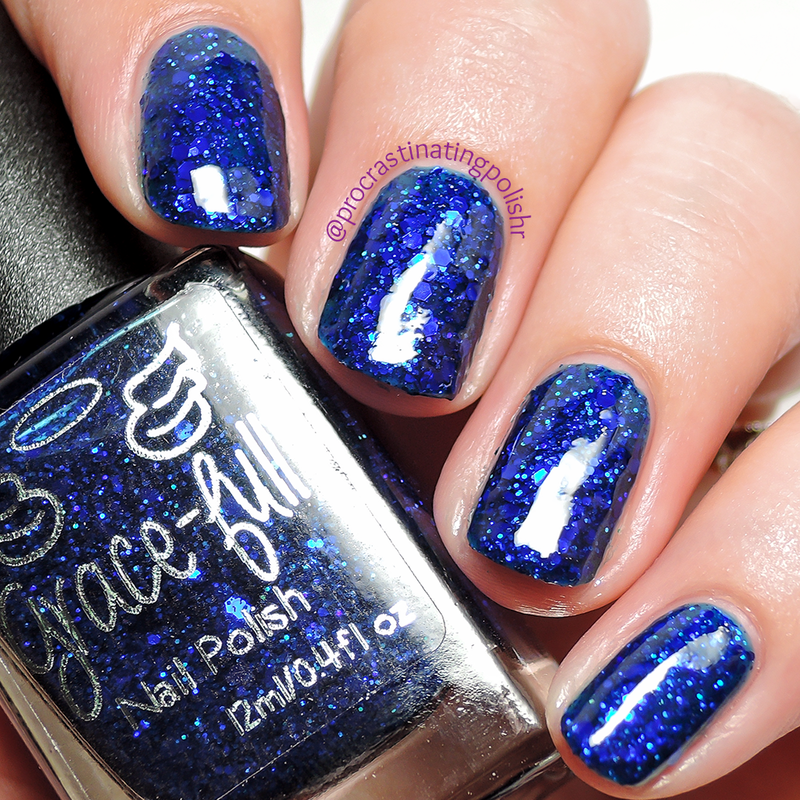 Stunning sapphire glittery jelly goodness. There is a generous serve of glitter in several sizes, and I would assume that the formula was spot on (I really didn't get any further than one excited drawn out word). The picture below is more colour accurate, though above is what you'd see in low light. 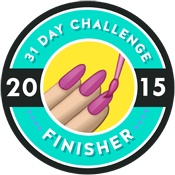 See you tomorrow for part 2, cremes and nail art! These are currently all available via Grace-full Nail Polish for $9.50 each. There are 13 in this collection so head over and check out the rest! 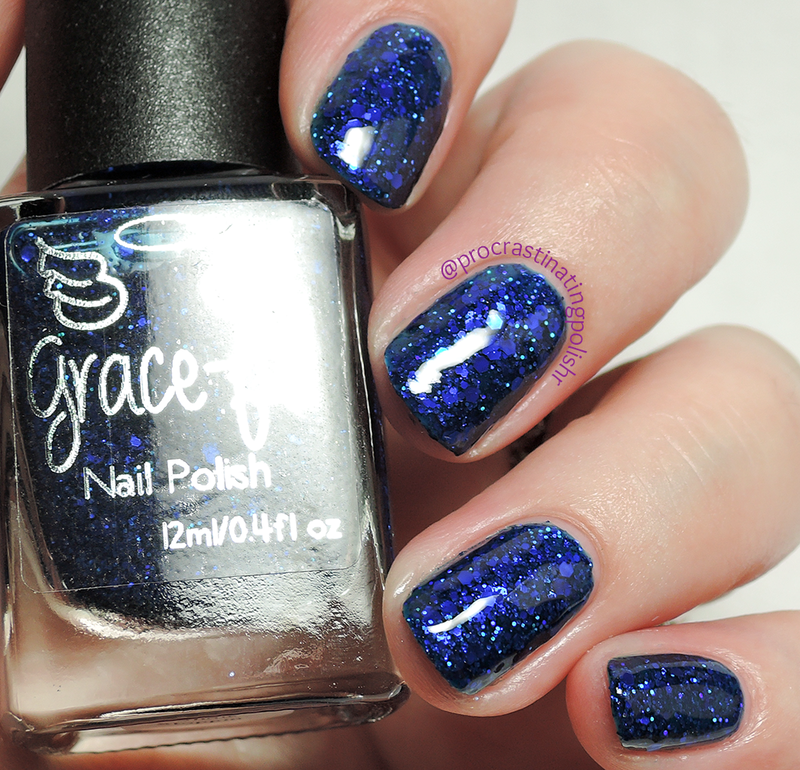 *The abovementioned products were provided by Grace-full Nail Polish for review, which in no way affected my opinion of the product. Please refer to my Disclosure page for more information.